Two Palestinian journalists were killed and scores of others injured by Israeli army fire in 2018, a Palestinian NGO reported on Monday. 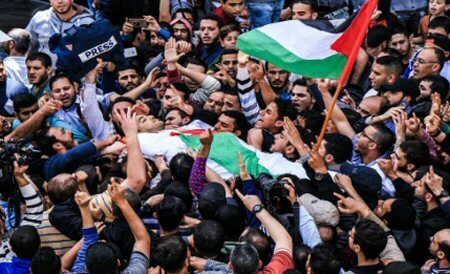 Yasser Murtaja and Ahmed Abu Hussein were killed in April, while covering anti-occupation protests near the Gaza-Israel buffer zone, the Gaza Center for Media Freedom said, in a statement. It said, according to Al Ray, that a total of 262 journalists were also injured by Israeli forces, last year. The report cited 668 violations committed by Israeli authorities, against Palestinian journalists and media institutions, in 2018, including 39 abductions. “Israel carried out 36 raids on media institutions,” the NGO said, adding that Israeli forces confiscated or destroyed equipment in 30 related cases, and prevented journalists from covering or travelling abroad for media coverage in 43 cases. The NGO documented four cases in which Israel shut down media and printing establishments and imposed 9 house arrests on Palestinian journalists.